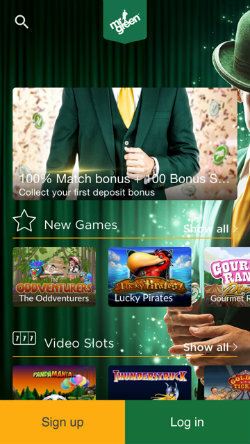 The Mr Green casino app is an ideal way for i-Phone & i-Pad users to play casino online. Use the app to access Mr Green online casino and play quality mobile casino games by leading software companies. 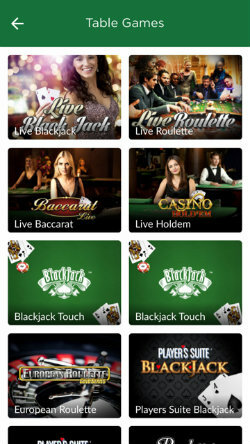 The app is regularly updated with casino bonuses and new titles to supplement an already vast selection of mobile games. You can use it to play your favourite video slots and jackpot games on the move. There are also table games, video poker games and even live dealer casino games. Mr Green Casino is licensed and regulated by the UK Gambling Commission. This allows you to place bets via the iOS app from anywhere with a suitable data connection within the United Kingdom. You can open an account using the app to qualify for the same Mr Green casino bonuses that are available to desktop users. The current welcome package is a 100% deposit bonus, up to £100 and 200 free spins to use on Mr Green Moonlight. Getting the Mr Green Casino iOS app on your mobile is easy. Simply go to the app store from your i-Phone or i-Pad and enter a text search for Mr Green Casino. Once you have located the app, just download and install it as you would any other application. As long as you’re located within the UK, you’ll be able to access Mr Green to play casino online and take advantage of the casino bonuses. Therefore, you can use a desktop PC, laptop, smartphone or tablet to open an account and claim the welcome bonus with a view to downloading the iOS app at a later date. The Mr Green iOS App is a great looking piece of kit. The green colouring that is synonymous with the internet casino site and glimpses of Mr Green himself are ever-present on the app. The colour scheme is complimented by light text and yellow highlights to draw your attention, making it very easy on the eye. Finding your way around is easy, with clear and concise headings and supporting icons. The homepage of the iOS app is split into the following sections; New Games, Video Slots, Top Rated, Jackpot Games, Table Games & All Games. You can swipe left to right on the row of games under each heading, or tap show all to browse one of the categories in more detail. Scroll all the way to the bottom of the screen to see Mr Green customer support information and details of various other rules and regulations. 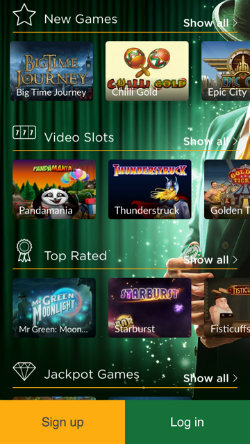 The games on the Mr Green Casino app are produced by Microgaming, NetEnt, Nyx Interactive, Betsoft, IGT, Leander, Quickspin, Thunderkick, Elk, NextGen, Play’n GO, WMS, Genesis, Yggdrasil and Merkur Gaming. New titles are added on a regular basis, so it’s a good app to have on your i-Phone or i-Pad if you like to try out new games. Mr Green Live Casino games are located within the table games section. You can use the app to play Live Roulette, Live Blackjack, Live Baccarat and Live Hold’em. There are also online casino versions of both Blackjack and Roulette, plus an extensive range of video slots with enough variety to rival any other casino app. The video pokers do not have their own section and are hidden away in the ‘All Games’ section, while there are only two progressive jackpot games to choose from. All things considered, the Mr Green iOS App is among the best online casino apps and is definitely a bit of software that you should try out. It’s particularly good if you like to play live dealer casino games on your mobile. On the whole, navigation is easy enough and the games take only a short while to load, so it’s an app that we’re happy to recommend.